Following a deadly car-accident, Police are investigating 35-year-old Helen Liebermann for negligent homicide, and neither her work nor her partner Dirk (Torben Liebrecht) can give her back the strength and confidence that used to constitute her life. After just a few days the investigation is halted. Helen is not to blame, but the strange circumstances of the accident remain unclear and keep bothering her. What was Moritz doing in the middle of the night in the freezing cold, ten kilometers from the next town, without a jacket, bare-feet and cowering in the middle of the road? 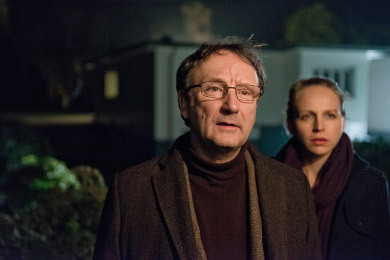 While Helen keeps pushing Dirk away, it is her lawyer, Wagner (Rainer Bock), who seems to be sharing a similarly tragic past that she confides in and asks for help. Together they reconstruct that fateful night and are confronted with the terrifying truth. Petra Schmidt-Schaller, Torben Liebrecht, Rainer Bock, Michael A. Grimm, Ann-Kathrin Kramer, Peter Benedict a.a.